Dungannon Swifts manager Kris Lindsay. Pic by Pacemaker. The centre-back enjoyed trophy success in Belfast blue as a Linfield favourite and that deep desire to constantly drive forward sits central to Lindsay’s management philosophy. A three-game unbeaten run in the aftermath of early successive league defeats suggests small but signifcant strides over his first weeks embracing that ultimate responsibility. “It’s about small strides but the message is starting to get across to the players,” said Lindsay. “You can see that over the past three games and they now should take confidence from those results and look to build. “We need wins in the league and points on the board, the goal is always to look for the victory. “The small goals are about coming back in and not simply celebrating gaining a point but asking what do we need to improve to turn that draw into a win. “Ultimately, it is about moving off that bottom place and up the table. “So much of my attitude comes from that time at Linfield and a career background at clubs, in the main, competing for honours. “I was around that for the vast majority of my career and bring that experience to management. 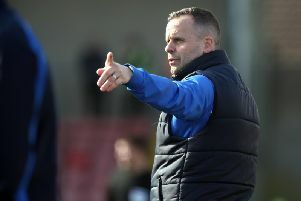 “Coming out of those dressing rooms and that mentality down the years, I want it to be more than about simply avoiding relegation with Dungannon. “The demands from the fans and everyone at Linfield are still the same to this day I’m sure. “After losing to Ards last weekend, the idea of two defeats in a row in the league would be unthinkable to the fanbase. “We need to go into these games with respect but never fear. “But there is also the realisation you can only do so much and once players cross the white line you need the individuals. “The good thing is, for me, I feel they are at Dungannon already, the quality and attitude we need to push on and overcome the problems which have left us sitting bottom at present. “The mental aspect is so important as we want the squad to have leaders, guys willing to step in and support a team-mate if he is having an off day. “The reality is football remains a results-based business but getting to know the players takes time and they need a period of adjustment to learn my methods and those of the coaching team. “It is important to know my squad as people as much as players, as both the physical and mental must work together. Linfield hit the road aiming to get back on track following last weekend’s shock defeat away to Ards. Midweek knockout derby delight against Glentoran handed Linfield a lift. “We will take the confidence out of the win,” said Linfield boss David Healy on the club’s official website following the Glentoran tie. “It’s a big game for us.